Today’s post was authored by a Guest Contributor, independent historian Jeffrey Green of England. When I returned to Charleston in June 2010 to attend the Charleston Jazz Initiative’s weekend, I visited the Avery Research Center to investigate a postcard of Buckingham Palace. 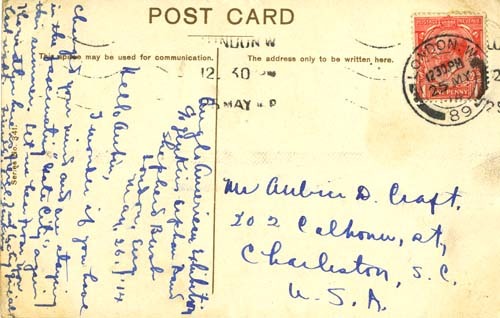 Mailed in 1914, the postcard was addressed to the son of English-born Ellen Craft Crum of Charleston. Prior to my South Carolina excursion, an Avery archivist had contacted me as the card seemed to be from Edmund Jenkins, whose biography I wrote in 1982. I drove twenty miles to Ockham Park, where Ellen Craft Crum’s fugitive slave parents had lived in the 1850s, in order to visit All Saints Church and examine its baptism register. The link between Charleston and England continued, as I discovered images of that very church in Avery’s recent acquisition, the Craft and Crum Family Papers. Village historian Mary Watson took me to All Saints, where I noted the baptisms of three of the children of Ellen and William Craft – whose Running a Thousand Miles for Freedom (1860) told how they escaped slavery from Georgia in 1848. Ellen had the colouring of her white father, which was used to advantage when, dressed as man and with William as her slave attendant, they escaped north. In November 1850, they sailed from Canada to Liverpool. They made very public appearances in anti-slavery activities around England, often with William Wells Brown, where they must have met Stephen Lushington, a brilliant lawyer, Member of Parliament, and ferocious anti-slavery campaigner who had lived at Ockham Park from the late 1840s. The register noted Charles Estlin Phillips Craft was the son of “fugitive slaves,” and the entry for 26 April 1862 recorded the baptisms of Stephen Brougham Dennoce Craft and Alice Isabella Ellen Craft, their parents being “of London” with William “on a Mission to Africa.” Mrs. Watson recalled two visitors enquiring about the Crafts, a pilgrimage made by Herbert and Emily DeCosta in 1980. All Saints Church held other interesting links. A brass wall memorial to Stephen Lushington noted his “especial devotion to the Abolition of the Slave Trade.” A smaller tablet honored Thomas Heath Popplestone, who had died in Freetown, Sierra Leone in 1872 aged 37, having been principal of the Ockham school for nine years. William Craft’s sojourn in Africa was far from Sierra Leone, in Whydah, Dahomey (now Ouidah, Benin). There, he established a school for boys and ran it for three years in the 1860s when the town’s population was under 30,000. The final shipment of slaves to the USA had left there in May 1860. In London, the Crafts were joined by Ellen’s mother Maria Smith in 1865 and they raised their five children (William and Alfred were the newcomers). They left England in August 1869, with Brougham and William, Jr. staying behind to complete their education into 1873. The Crafts purchased land near Savannah, Georgia and established another school on the lines of Ockham, and there Ellen Craft was buried in 1891. Her husband moved to Charleston, where he died in 1900 at the home of daughter Ellen Craft Crum, wife of physician Dr William D. Crum – the very house where that London postcard had been mailed in 1914. My research in Charleston in 1979 had uncovered the history of the Jenkins Orphanage, the composer son of its founder, and the latter’s career including seven years at the Royal Academy of Music in London 1914-1921. Through this work, my interests became focused on the history of black people in Britain, and the five England-born Craft children, who had been teenagers when they left for America, present a new topic. 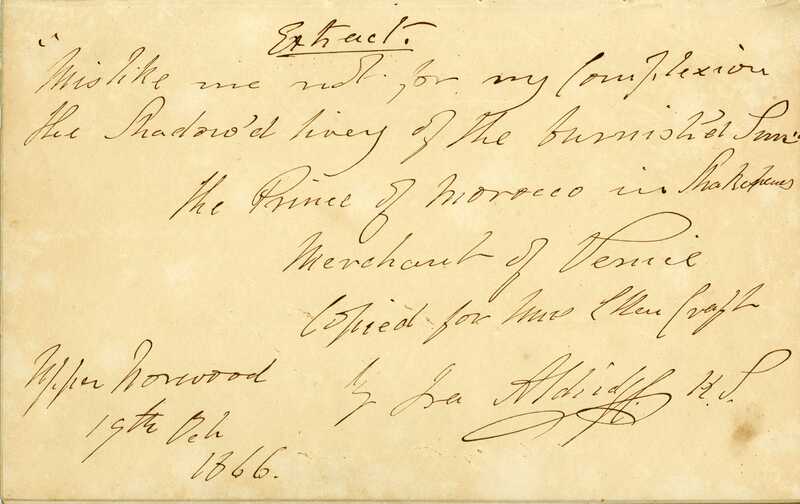 To my delight, Avery’s new deposit contains two letters to Ellen Craft, dated 1866, from the New York-born actor Ira Aldridge and his Swedish wife; they lived near south London. It is unlikely that we will uncover information on the experience in England of the five children, but Ellen Craft Crum had gone with Dr. Crum to Liberia 1910-1912 and perhaps an African link continued. — Jeffrey Green, East Grinstead, England, 15 June 2010. Green’s printed works include Edmund Thornton Jenkins: The Life and Times of an American Black Composer, 1894-1926; Black Edwardians: Black People in Britain 1901-1914; and Swing from a Small Island. He is completing a biography of composer Samuel Coleridge-Taylor, the London-born son of an African. Green’s website jeffreygreen.co.uk references numerous items about the black presence in Britain, with some South Carolina details. Wow, this is amazing. I think there should be more coverage of black britians (and black europeans as a whole, particularly those who are descendents of slaves) in current black studies programs here in the US. Our link is worldwide and it can definitly help us to find out more about Black american history or the african diaspora as a whole. Currently, I am an Assistant Professor of Art at Claflin University, Orangeburg, SC and I have been practicing art for many years. I am researching institutions that will allow me the honor to exhibit my works as I gain a national reputation as a fine artist. With this in mind, please review my works at the links and website listed below. Additionally, you are cordially invited to “Unveiling of the Masquerade: Ceramics and Mixed Media (solo exhibition),” Richland County Library, Columbia, SC and “A Greater Spectrum: African American Artists of Nebraska 1912-2010 (group exhibition), Museum of Nebraska Art, Kearney, NE. Thanks for the list of Claifin sites. I’ve understand your stuff previous to and you are just extremely magnificent. I really like what you’ve acquired here, certainly like what you’re saying and the way in which you say it. You make it entertaining and you still take care of to keep it sensible. I can’t wait to read far more from you. Good Article. Thanks for information. Pretty! This was a really great submit. Thank you to your provided knowledge. Thank you This was a really great submit. Thank you to your provided knowledge. Very nice article. Great site. Thank you for your post,really good.